By the light of a waning moon, a Russian rocket carrying a veteran cosmonaut, a French flight engineer making his first flight and America’s most experienced female astronaut blasted off and streaked smoothly into orbit Thursday, the first step in a two-day rendezvous with the International Space Station. The workhorse Soyuz-FG rocket roared to life with a torrent of fiery exhaust and climbed away from its pad at the Baikonur Cosmodrome in Kazakhstan at 3:20 p.m. EST (GMT-5; 2:20 a.m. Friday local time), quickly accelerating through a cold, cloudless sky and flying directly into the plane of the space station’s orbit. Live television views from inside the Soyuz MS-03/49S ferry craft showed commander Oleg Novitskiy strapped into the center seat, flanked on the left by European Space Agency flight engineer Thomas Pesquet and on the right by Peggy Whitson, making her third flight to the station. 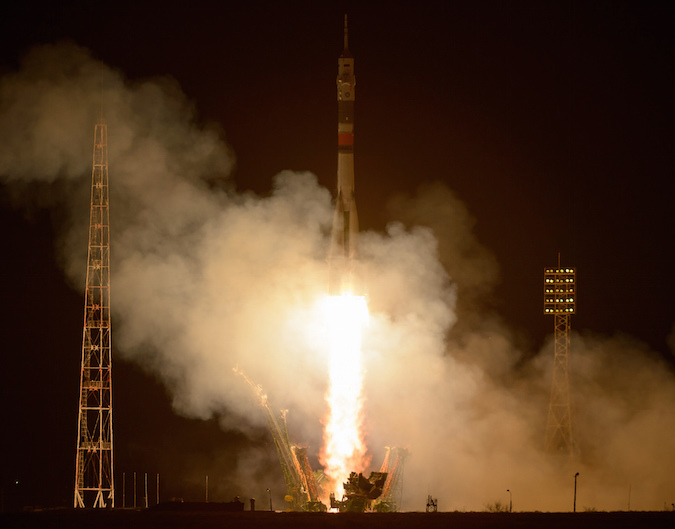 “The crew is feeling fine,” Novitskiy reported as the rocket accelerated toward space. Eight minutes and 45 seconds after launch, the Soyuz MS-03 spacecraft was released from the booster’s upper stage to fly on its own. Moments later, the ferry ship’s two solar arrays and antennas unfolded and locked in place as as the crew set off after the station. This is the third flight of an upgraded MS-series Soyuz, featuring improved communications, navigation and propulsion systems. As with the first two flights in July and October, the MS-03 crew will take two days to catch up with the space station, giving Russian engineers and flight controllers time to continue tests of the upgraded systems. 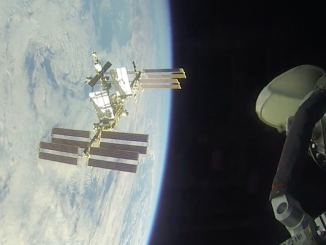 But if all goes well, Novitskiy and Pesquet a former Air France pilot, will oversee an automated approach to the station Saturday, moving in for a docking at the Earth-facing Rassvet module around 5:01 p.m. The linkup will come 18 years to the day after launch of the Russian Zarya module, the station’s first component. Standing by to welcome Novitskiy and his crewmates aboard will be Expedition 50 commander Shane Kimbrough, Soyuz MS-02 commander Sergey Ryzhikov and flight engineer Andrey Borisenko, who were launched to the station Oct. 19. They’ve had the lab to themselves since Oct. 30 when three other crew members — Soyuz MS-01 commander Anatoly Ivanishin, Japanese astronaut Takuya Onishi and NASA astronaut Kate Rubins departed and returned to Earth. With the arrival of the MS-03 crew, the station’s crew will be back up to six, allowing a full slate of research. Whitson, 56, holds a doctorate in biochemistry. She is America’s most experienced female astronaut, veteran of two long-duration stays aboard the station in 2002 and 2007-08 totaling nearly 377 days aloft. She served as commander of the station during her second visit and was the first non-military pilot, and first female, to serve as chief of NASA’s astronaut office at the Johnson Space Center. During her third space flight, Whitson will set a new record for total time in space by a U.S. astronaut. 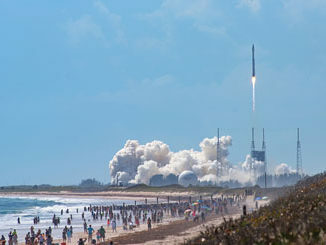 On April 24, she will surpass the 534-day mark set in September by astronaut Jeff Williams. With a landing in mid May, her time aloft over three flights will total about 555 days, moving her up to ninth in the world. Like Whitson, Novitskiy is a veteran space station crew member, serving as a flight engineer during a 144-day visit in 2012-13. Pesquet, an aerospace engineer and veteran Air France pilot, is making his first flight. 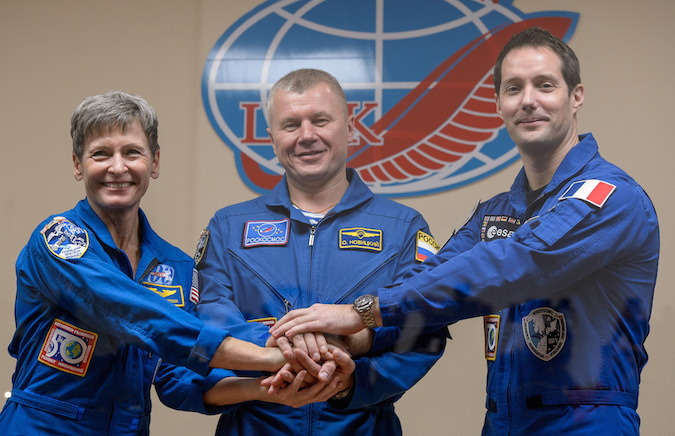 During their stay aboard the station, the expanded crew will welcome a Russian Progress cargo ship on Dec. 3 and a Japanese HTV freighter on Dec. 13. The HTV will be carrying six state-of-the-art lithium-ion batteries that will replace 12 aging power packs in one set of the station’s solar arrays. The batteries will be installed during at least two spacewalks in January. 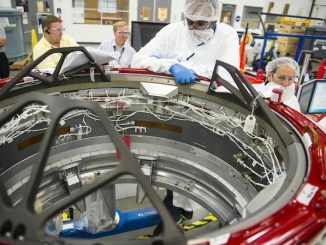 Additional spacewalks are tentatively planned in the March-April timeframe to attach a short tunnel-like pressurized mating adapter to a port on the forward Harmony module that eventually will be used by commercial crew ships being built by Boeing and SpaceX. One such port already is attached to the front of the station. Along with routine research and spacewalk planning, the station crew also hopes to welcome two SpaceX Dragon cargo ships, one in January and one in March, along with a Progress supply craft in January and an Orbital ATK Cygnus cargo ship in February. SpaceX, however, is still recovering from a Sept. 1 launch pad explosion, and while the company hopes to resume launchings in December, it’s not yet clear when the Dragon cargo missions will actually fly.